A man leaves his home-town to take his life into his own hands. The plot is well-known and has often been put on screen, especially in the Soviet Union (e. g. the Soviet classic Mimino by Giorgi Danelia), and yet Giorgi Shengelaia’s Pirosmani is a movie whose originality in many ways lives up to the idiosyncrasy of its protagonist. The film about naïve painter Pirosmani was one of Shengelaia’s earlier movies but is nevertheless widely considered among his most important works. Nikoloz Pirosmani was a Georgian painter active around the turn of the 20th century and is considered an important representative of naïve art. However, like many artists growing up on the countryside, he was discovered very late and lived a big part of his life in poverty. In Pirosmani, Shengelaia shows the audience the tragic tale of a man who does not find his place in society. At the same time, it is also a movie told through images. In short episodes that are introduced by paintings of Pirosmani, we follow the protagonist (played by Avtandil Varazi) walking down from one end of the frame to the other, searching for a place where he is welcome. The protagonist manifests his talent by painting out walls, letterings or paintings that ornament the many restaurants of Tbilissi, Georgia’s capital. The world that Shengelaia depicts in his movie is over-shadowed by a strong feeling of melancholy. 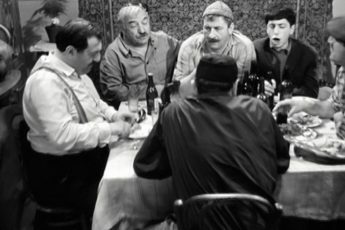 In spite of the fact that most scenes are set in restaurants, wine cellars and at feasts, the audience is exposed to a sad and desolate world that lacks true communication. The protagonist is not following a clear goal; he is searching for understanding that in the end remains incommunicable. Accepting his fate, we see Pirosmani crouched down in the end of the movie, rejecting the world he was rejected by. In this sense, Shengelaia’s work is not a simple biography or the attempt to illustrate the life of a great artist. The picture stands for a time and finally for a nation. Tragically, it is Pirosmani – the only person who seems to look behind the façade- who is left unheard. Giorgi Shengelaia’s work is representative for a New Wave that is still almost undiscovered: like in France or the Czech Republic, in Georgia, too, the 60s generation (Samozianelebi) was the high-point of cinematic culture. 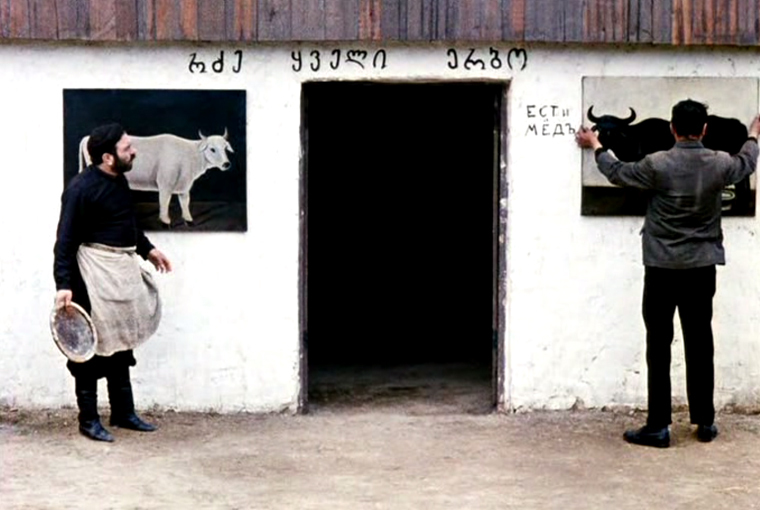 In fear of the restrictive censorship under the Soviet Union, Georgian cinema developed a distinct fable language. The movies said little openly, the story was often set in the past, the messages hidden behind the curtain of time. The directors of the 60s generation- Tengiz Abuladze, Rezo Chkheidze, Mikheil Kobakhidze, Giorgi Shengelaia, Merab Kokochashvili and finally Otar Iosseliani, probably internationally the best-known Georgian director who is now active in France, dealt with epic conflicts and a Georgia that was searching for its identity. 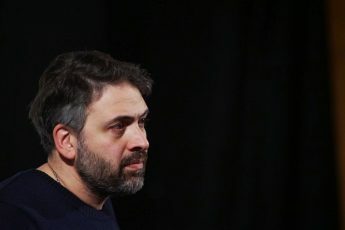 Even if Iosseliani stands out of the Wave as he did not pick up the fable language, his films are marked by vagueness and forsakenness, recurring themes of the Georgian 60s generation that root both in the Zeitgeist and the circumstances under the Soviet Union. But the restrictions in the story also led to a film that was visually funded: the 60s generation is not only the high-point of Georgian cinema, it is also the high-point of Georgian cinematography. It is a movement of big images that can arguably be compared to the cinemas of the big film countries France or Italy. Director Giorgi Shengelaia comes from a family of filmmakers: his older brother Eldar Shengelaia directed some of the classics of Georgian comedy; their father – Nikoloz Shengelaia – was the father of Georgian silent film, their mother – Nato Vachnadze – the leading role in many of Nikoloz’s films. In Pirosmani, the leading role is played by Avtandil Varazi, who delivers a persuasive and insightful performance. Varazi was himself a painter and was also responsible for the colorful and atmospheric art design of the film. Nevertheless, he was not an actor and did not commit to an acting career even after the film which brought him considerable fame in Georgia. His performance is minimalist and in its unconditional certainty resembles that of a great actor; an actor who understands and gives in to his character. 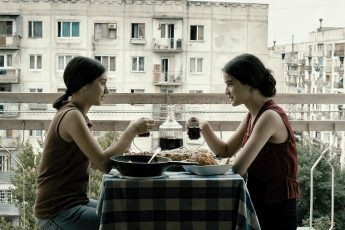 Pirosmani is a story that communicates many aspects of Georgian society and themes hidden behind beautiful cinematography. It is a film that asks to be viewed, and understood.